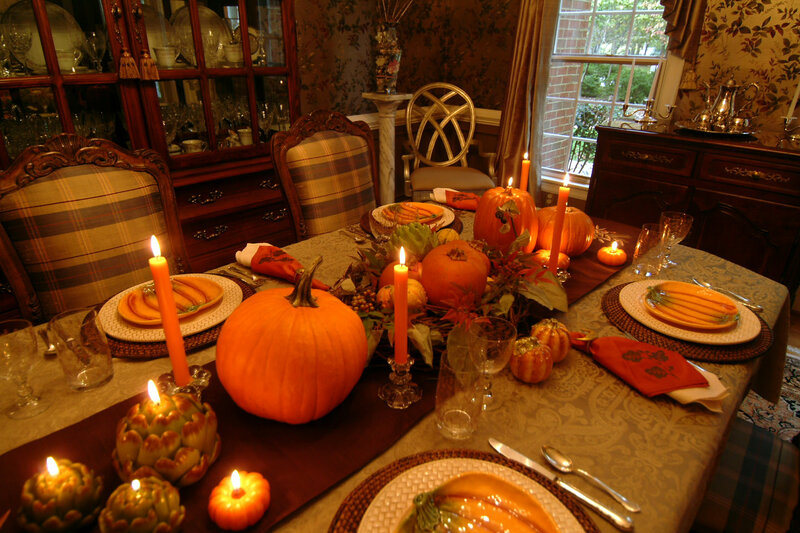 With the holidays and cooler weather on the way, I am ready to start decorating and planning meals for friends and family. I have begun making lists and making out menus. With all the parties and entertaining in the near future, I am beginning to have a bit of anxiety about (dare I mention it) the dreaded five- to ten-pound weight gain. I have many, many diet books, and I'm sure they would all work really well if I could stick to them as written, but for some reason, I falter after just a few days. I am pretty good about exercising, and I have been walking for an hour a day with a friend in the mornings. It seems that the older I get, the easier those pounds creep up. 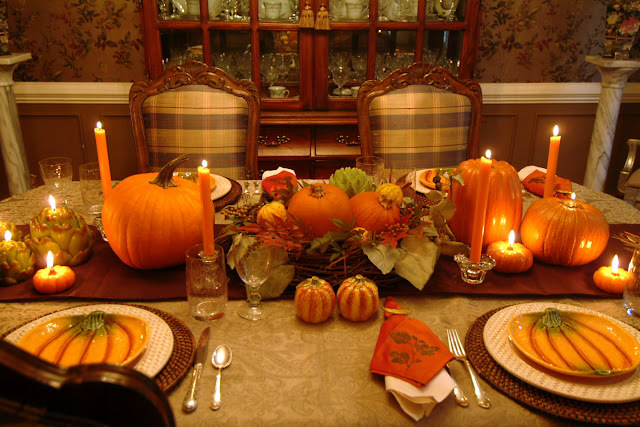 The joys of being around a beautiful holiday table with our loved ones is such a fulfilling experience--emotionally and gastronomically, and is one that I am not willing to give up to be slim. Hopefully I can exercise moderation, and allow the magical moments and memories that are being made to fill me up. I intend to savor every minute and morsel, and cherish the time spent with those around me. In January, I will let you know which diet plan I intend to use. 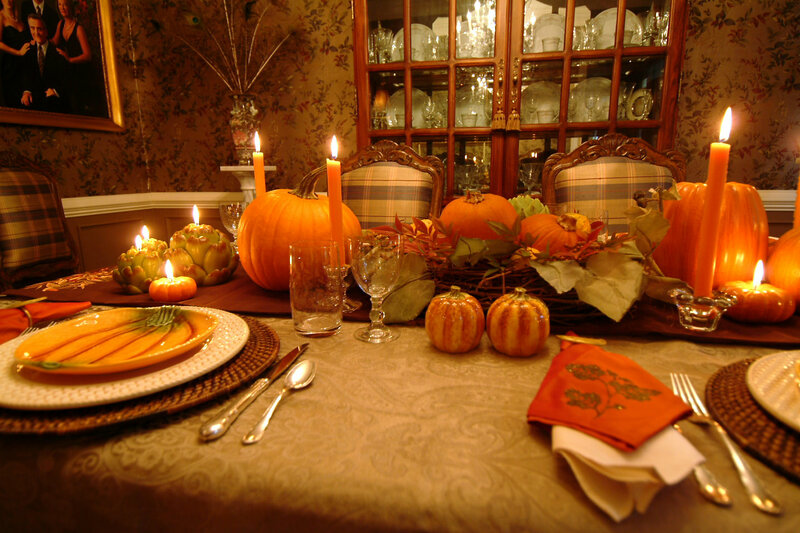 The table is set and ready for you!! 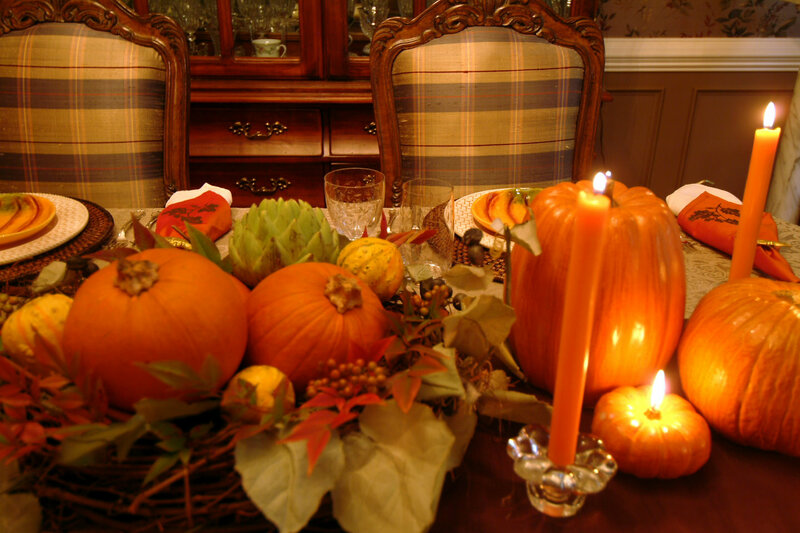 Lots of pumpkins, warm colors, and texture create a cozy setting. To create this centerpiece, I started with a grapevine wreath which already had artificial grape leaves. I piled on three pumpkins, gourds, and an artichoke, filling in with nandina leaves and berries. To the left of the centerpiece, I added another pumpkin, three artichoke candles, and one pumpkin candle. To the right, I added three pumpkin candles--purchased at Pottery Barn-- and another smaller pumpkin candle. I filled in with crystal candle holders and orange tapers. Chargers were purchased at Target, plate is Fitz and Floyd, purchased recently at Tuesday Morning, and pumpkin plates were purchased at TJ Maxx. Sterling is Lunt. Crystal is etched with gold leaves, and was purchased years ago at Tuesday Morning. 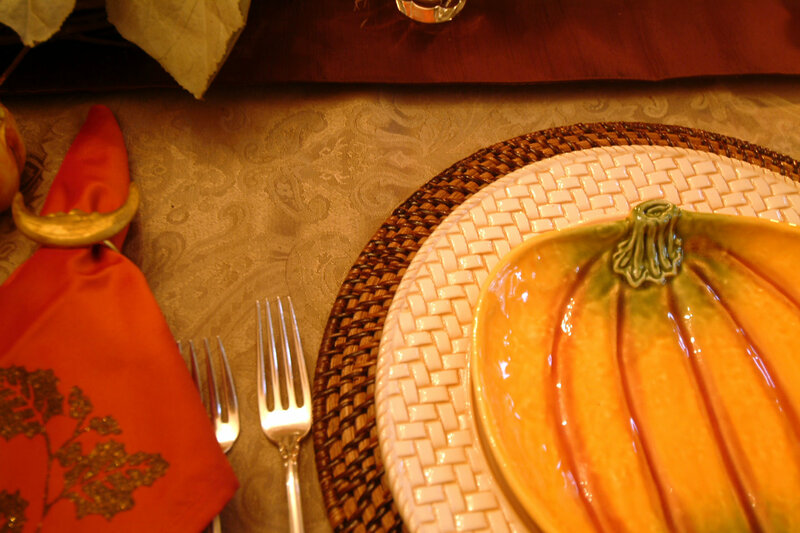 I used orange and beige colored napkins, with a "harvest" moon napkin ring. Table runner came from Home Goods last year, but I think they have them this year as well. I am so excited to be the winner of Anita's giveaway at Far Above Rubies. I won a set of Italian Countryside flatware by Mikasa. I hope to show it soon! 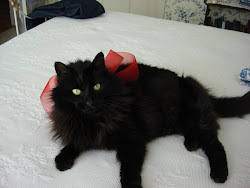 Please visit Anita and see all her lovely posts!! 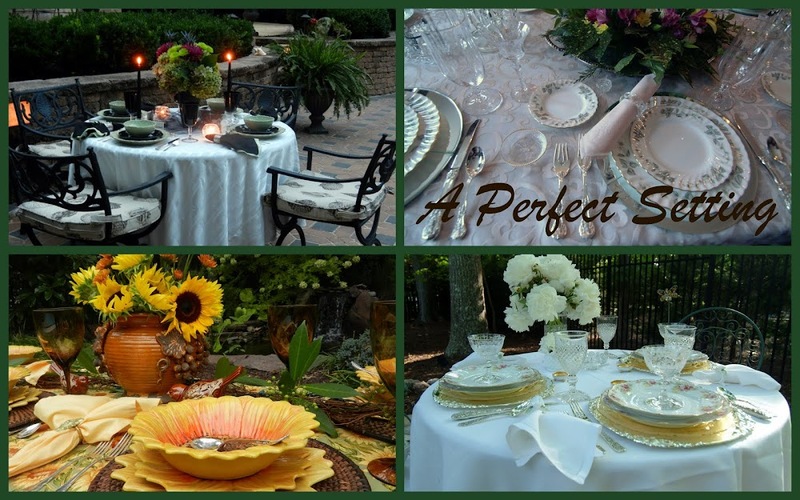 Thanks for stopping by, and as always, I am striving for A Perfect Setting!! Beautiful - elegant and comfortable. Who doesn't love pumpkins?? What a pretty centerpiece. Your table is very pretty. Love the candles, too. Congratulations, by the way, on winning the flatware! It will certainly be in good hands with you. I love your table. It couldn't be any more perfect for the season and the setting. My favorite part is the way the centerpiece spreads across the runner. It just looks like an abundance of plenty. Your dining room is so lovely, and I adore your little pumpkin plates that coordinate so well with the pumpkins in the centerpiece. It all looks so lush and pretty, and your lunt flatware sets it off perfectly. I just love this pumpkin themed table. Those pumpkin plates are so cute. I'd love to have some for my fall table. 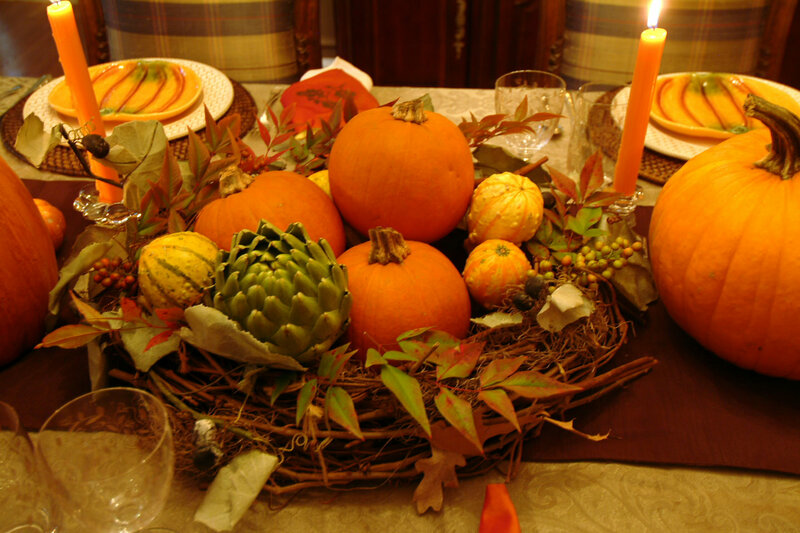 The spread of your centerpiece is very pretty and perfect for you fall table. Thanks for sharing your talent with us. 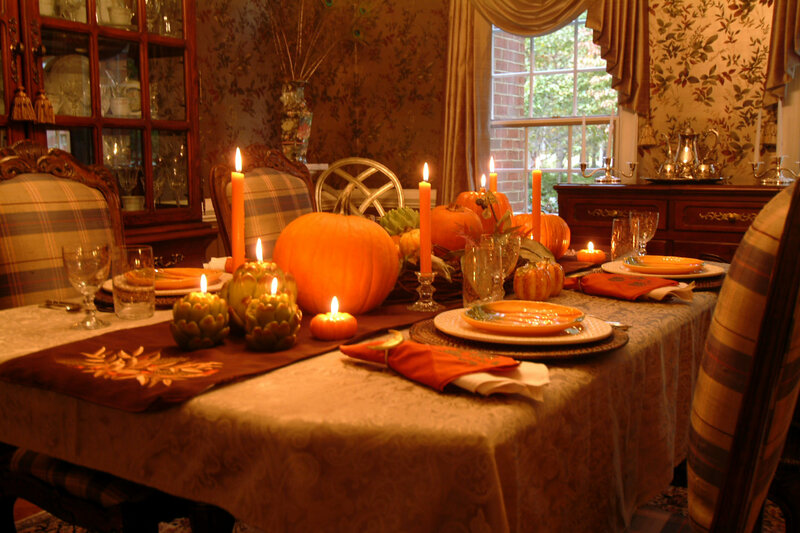 What an awesome room and I love your tablescape with all those pumpkins. I find that you can't go wrong with pumpkins when it comes to decorating. It is consumable decor and I like that. Please stop by for a visit and let me know that you dropped by too. 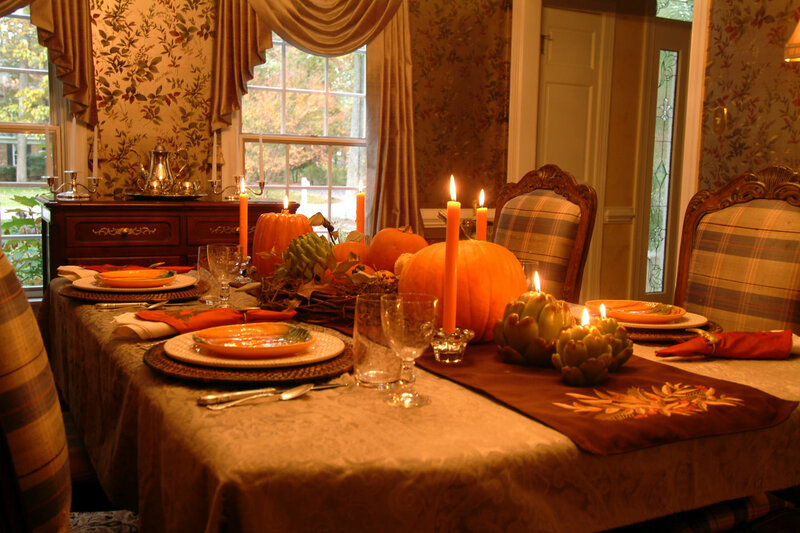 You have decorated your dining room (not just the table) so beautifully! Love the chandelier, the drapes and your dining set, especially the chairs - gorgeous! 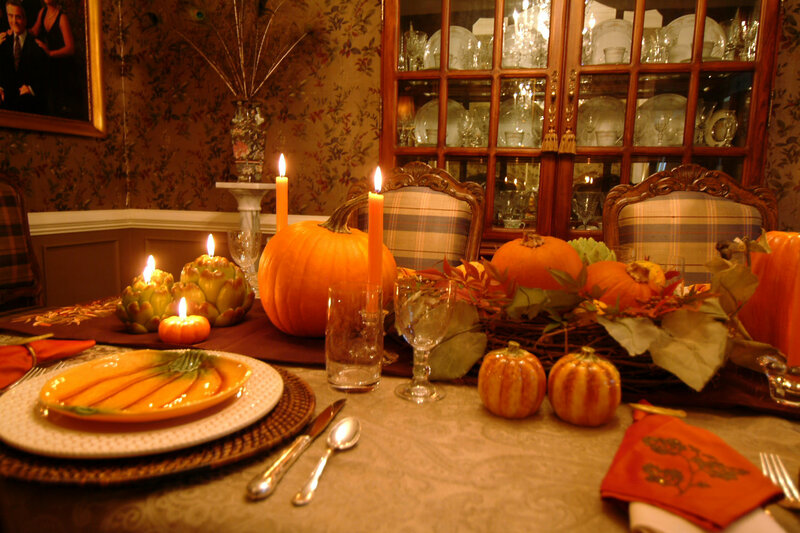 To top that, your tablescape looks perfect in the room! 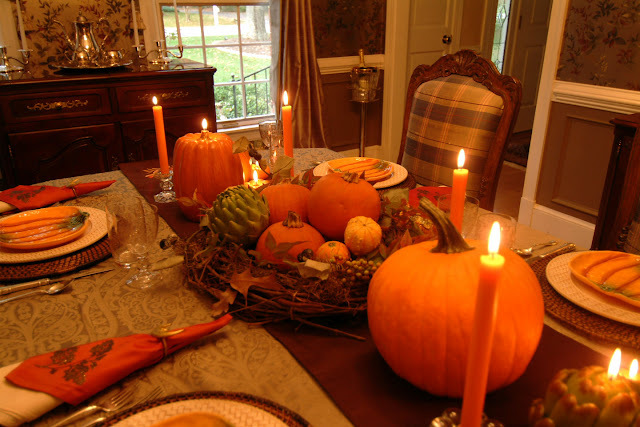 The pumpkins add such a brilliant pop of colour and the candles give a warm glow. The artichoke candles are so unique and look wonderful. The pumpkin plates tie it altogether! Love the total look! Congrats on your win -- we look forward to seeing it set upon an upcoming tablescape. 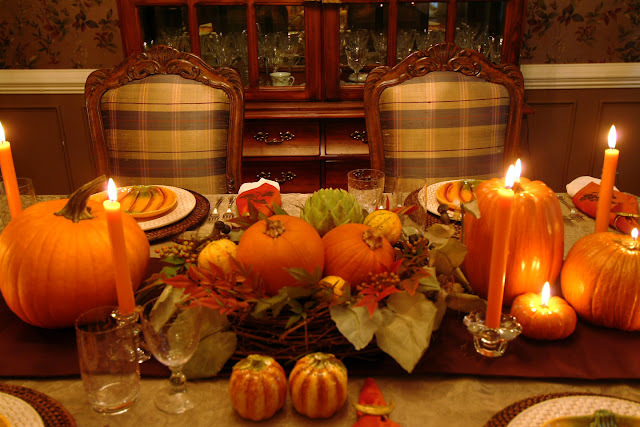 Your guests will be so charmed with this tablesetting -- all the beautiful elements of autumn. I love your combination of the plates -- this table has a wonderful warm glow about it. Congratulations! What a gorgeous room! 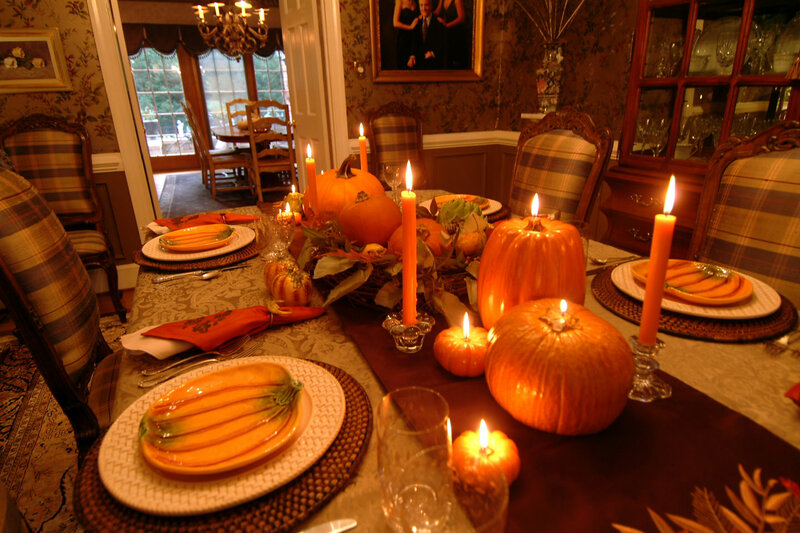 Love your pumpkin setting! Congratulations on winning the Mikasa flatware. I can't wait to see it on your table. Your tablescape looks like it came out of a magazine. 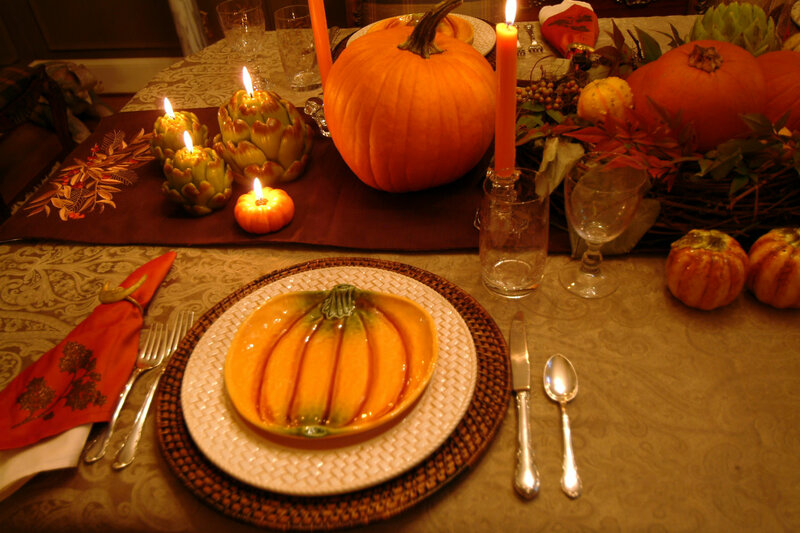 I love the pumpkins and all the texture at the placesetting is very beautiful. Congrats on winning the Mikasa flatware,don't you just love Anita and her blog,she IS far above rubies...love all the pumpkins.Setting is so charming. 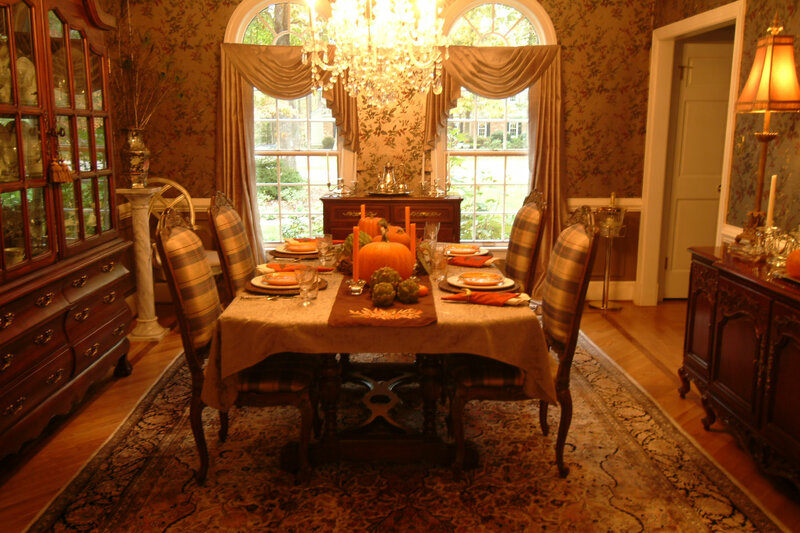 I love the mix of faux and real in your lush centerpiece -- it looks wonderful in your lovely formal dining room! I have ONE of those artichoke candles -- love it! I love all of the pumpkins! Everything is so nicely put together. 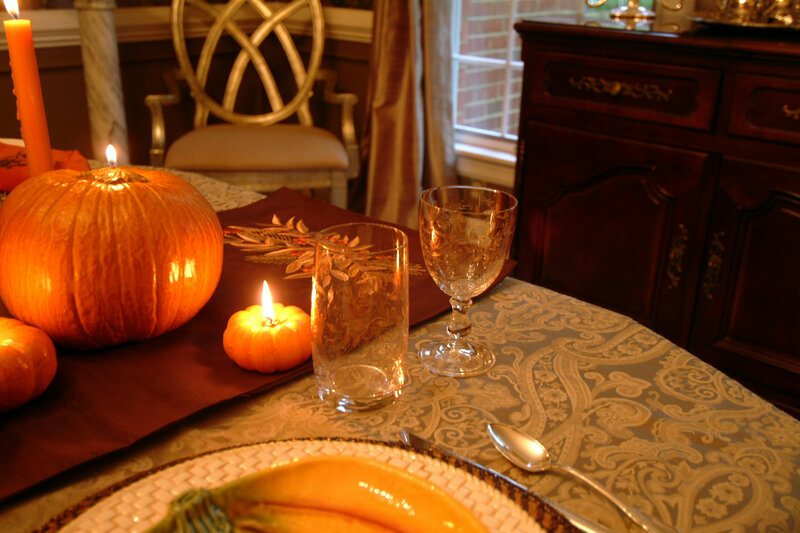 Those little pumpkin plates are adorable. Your dining room is just stunning!!!! I'm sure that all holidays are wonderful at your house! 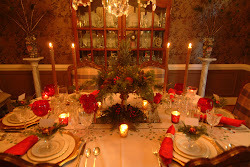 I'm looking forward to your tablescapes over the coming months!!! LOVE those Fitz & Floud plates!!! They are fabulous!!! And seriously...looking at your spacious dining room, I just want to cry! I know you must just love it! I'm not sure why the dining room in our home was seemingly created for gnomes. :-( I need a dining room the size of a football field, not a broom closet! At any rate, beautiful table. Have a great weekend! Really beautiful, simple but adds such a visual punch, this will be something I might steal! 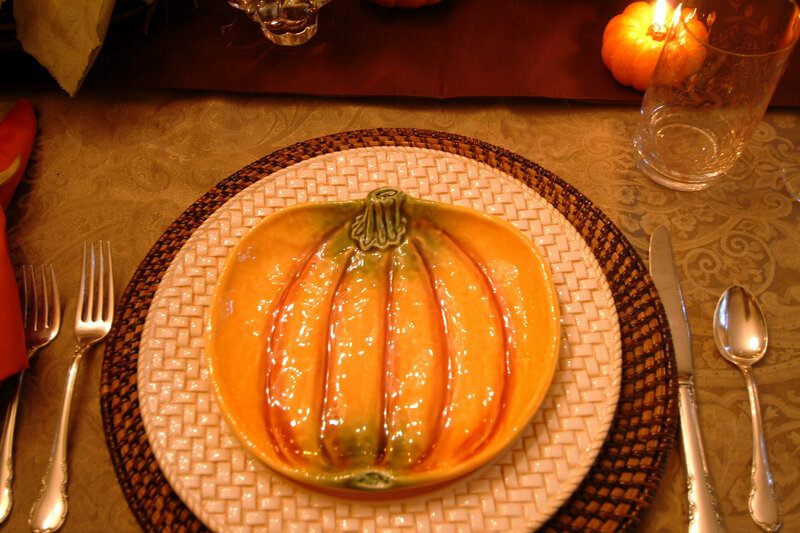 I just love your pumpkin plates. I love your tablesetting and in such a gorgeous room. I think gathering with friends and family over dinner is one of the most wonderful things to do. I really love the way you decorated the center of your table. Beautiful table, the woven plates are gorgeous. What a beautiful, warm, welcoming dining room, love the fabric on the chair backs. I love this room and table - so pretty warm and cozy. the candlelight adds to it all. Oh my goodness, your dining room is gorgeous! So warm and inviting your guest might never want to leave! 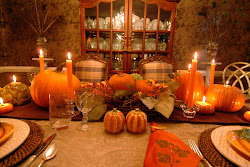 The table setting is perfect for the room and the season...I'm following. Absolutely beautiful. I could have an autumn setting year round. Ir's by far my favorite season. You did a lovely job here. I especially like that natural centerpiece. 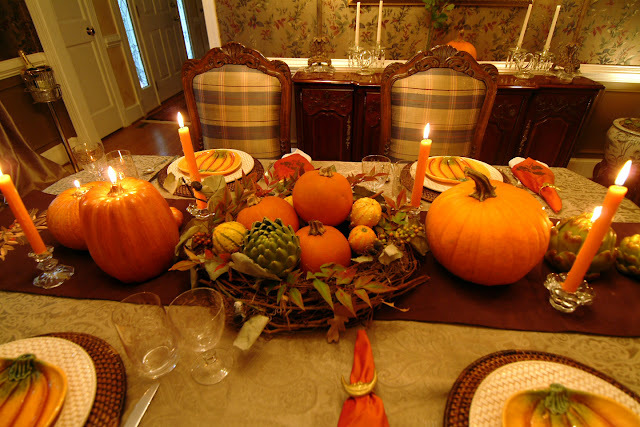 I have some natural pumpkins set out with our autumn table too. They are so pretty. Like that artichoke too. Great idea. Nature always has the most beautiful things to offer. This is my first visit to your blog and it's stunning! Of course I'm a self professed dish-aholic! LOL!! I can't wait to set my table. Thanks for the great ideas and letting us know where you made your purchases! If you have some time please "visit" me in New England, I love company and new Followers are always welcome. I enjoyed my visit! Can't wait to come back!